Delicious homemade gluten-free potato gnocchi recipe! 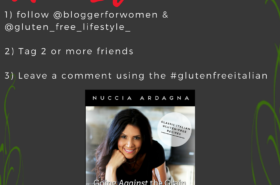 Making your own pasta seems like enough of a challenge as it is, but making it gluten-free on top of that? Now THAT’S asking for too much! Really? Nope! 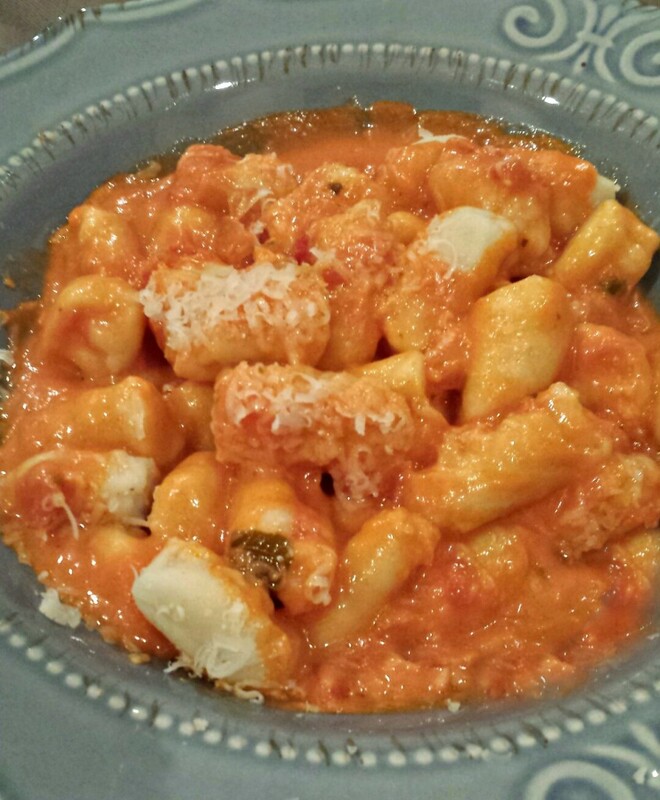 I loved my husband’s grandmother, nonna Vittoria’s homemade cavatelli as well as our own homemade gnocchi so that was one recipe that I was definitely looking to perfect and I wasn’t going to rest until it met our ‘standards’. I encourage you to try this recipe! You’ll find it in my book as well as other yummy dishes. The link to my book is also below. If you follow the steps below there’s no reason why you couldn’t be enjoying a delicious plate of delicous homemade potato gnocchi with creamy rosé sauce tonight such as the one shown in the picture below! Just so you know, the last time I made these a few weeks ago, we started the process at 4:30 and we were sitting at the dinner table enjoying them by 6:00 pm! We made 4 servings; for my family of 3 and my sister Marianna who is also celiac. We absolutely loved them! For the sake of simplicity we’ll use all-purpose gluten-free flour but my favorite brand is Bob’s Red Mill All-Purpose Baking Flour (Gluten-Free of course) and I used 2 teaspoons of Bob’s Red Mill Xantham Gum (also gluten-free). I’ll link the product details below as well. 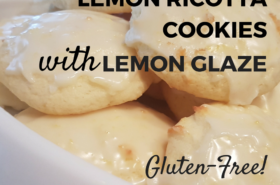 If you use all purpose gluten-free flour you will not need the xanthan gum so omit from the list of ingredients below however, if you are using Bob’s Red Mill All-Purpose GF Baking Flour you will need the xantham gum! All-Purpose GF Baking Flour as other all-purpose flours have xantham gum already added. In a large pot bring salted water to a boil. Add the potatoes and cook until soft and tender. Let cool slightly and peel. With a vegetable mill, mash the potatoes and transfer to a large wooden well-floured table or board. It is easier to work with a large space. If you do not have a large table or board, transfer the mashed potatoes to a clean countertop or a large bowl. Add the flour on top of the potatoes. Make a hole with your finger in the center and add the egg and salt. Work the mixture, kneading it until it forms a nice soft and smooth dough. If the dough is too sticky to work with, add more flour. You should have what looks like a ball of dough. Divide the dough into five equal pieces. Roll each piece to form a small rope, about one inch in diameter. Cut each rope into bite-size pieces about one inch long. Use a fork to create the gnocchi’s signature indentations. Place gnocchi on a fork; push down and roll off the fork. 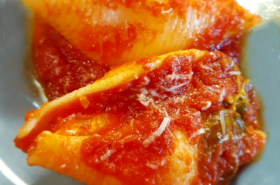 The gnocchi’s indentations allow the gnocchi to hold the sauce. 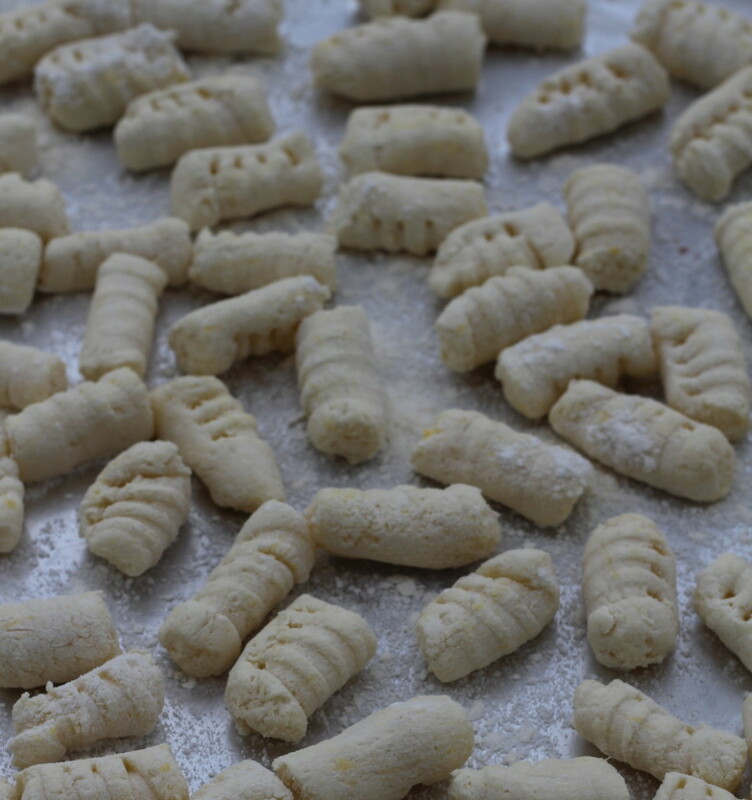 Place the gnocchi on a baking sheet lined with parchment paper to prevent sticking. Bring a large, well-salted pot to a boil. Add the gnocchi. As they rise and float to the top, remove them with a slotted spoon making sure to remove all the water and place in a large serving bowl. Add your favorite sauce and gently toss, being careful not to over-handle. Top with Parmesan cheese, plate and serve! Let me know how you make out with this recipe and feel free to ask any questions! Well I made them and OMG they were fabulous. I ate way to much, thank you. I took pictures they will be on my Face Book page along with a link to this recipe. WOW that looks amazing! I am not GF, but I would make this anyway!